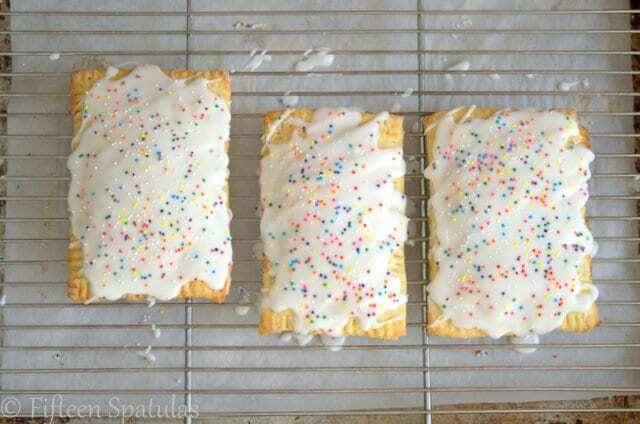 These homemade Poptarts are made with real pie crust and a strawberry preserve filling. They’re an indulgent, fun breakfast to make for special occasions! 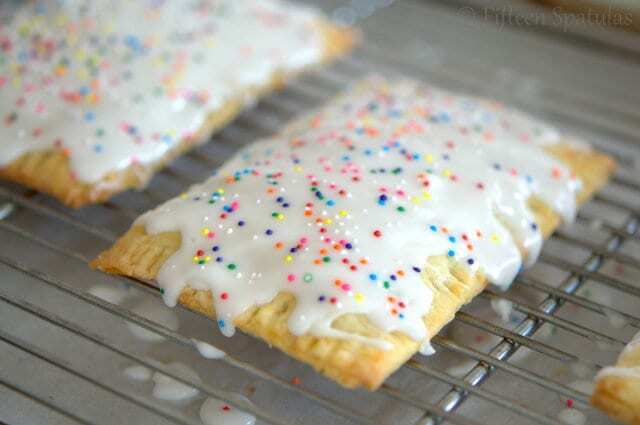 Raise your hand if you ate those toaster tarts as a kid. Oh how I loved those things. But you know, your tastes get a little more sophisticated as you grow up. And these toaster tarts address that. 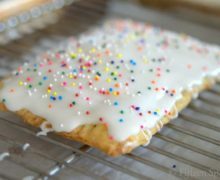 These are the adult version of toaster tarts, and are basically a hand pie with glaze on top. In the middle use your favorite jam, and make sure it’s a GOOD jam. If you wanted to make the filling a little less sweet and a bit more substantial, you could try chopping up some strawberries and cooking them with the jam. Mmm. These toaster tarts start out with pie crust. Not anything fancy, just an all-butter, flaky pie crust, which you roll out into a rectangle and cut into squares. 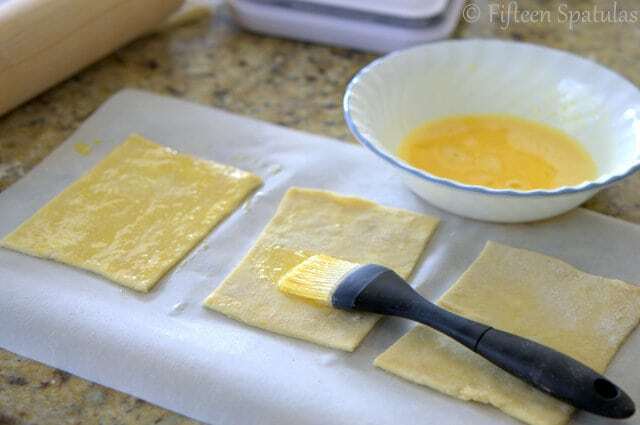 Brush half of the squares with egg wash. This will help the top stick. 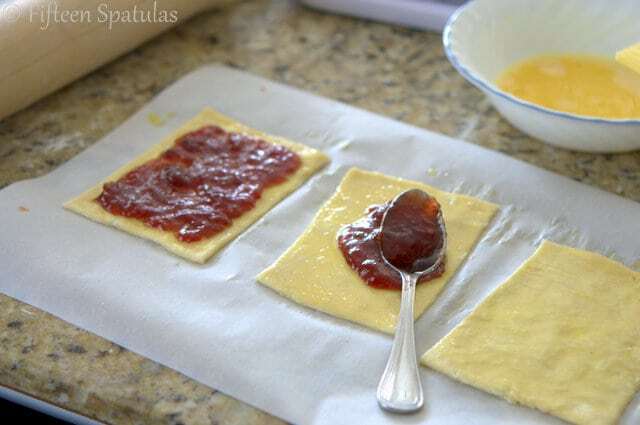 Spread your choice of jam out onto the squares, making sure to leave a border around the edges. 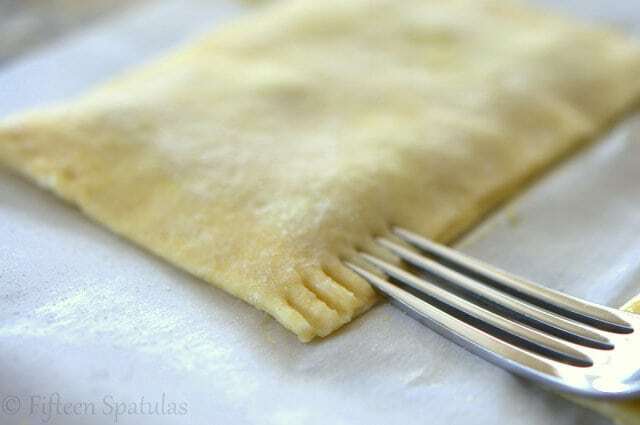 Place a square on top and start crimping the edges with a fork. Once the tarts are crimped shut, they’re ready to head into the oven. Let the tarts cool, then cover in a confectioner’s sugar glaze and add sprinkles, just because you can. 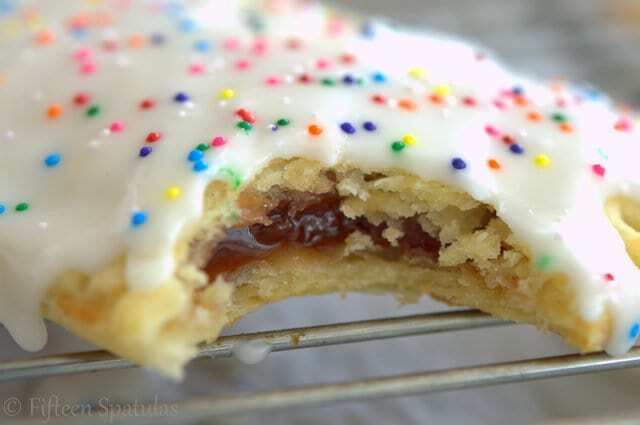 These homemade Poptarts are made with real pie crust and a strawberry preserve filling. They're an indulgent, fun breakfast to make for special occasions! For the pie crust, place the flour, confectioner’s sugar, and salt in a food processor. Pulse five times to aerate and combine the ingredients. 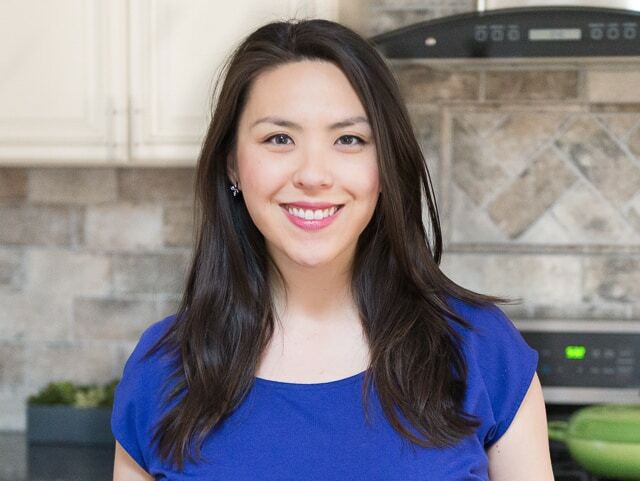 Add the cold butter to the food processor and pulse about ten times until the butter is broken down into pea sized pieces. Add the egg yolk, milk, and 2 tbsp of cream and pulse just enough to distribute the liquid and bind the dough. Do not overpulse, this will make your crust tough and chewy instead of flaky and tender. If needed, add more cream. 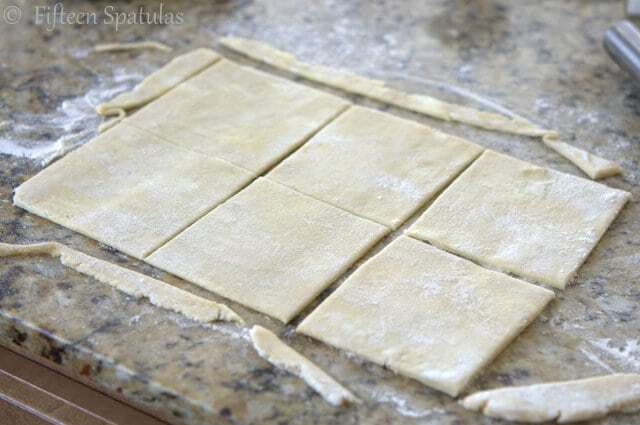 Shape the dough into a rectangle or disk, and refrigerate the dough for 1 hour. For the filling, place the strawberry preserves in a saucepan and heat over medium until it loosens and flows easily (about 3-4 minutes). Meanwhile, whisk the cornstarch with the vanilla extract and 1 tsp water until smooth, then add the cornstarch slurry to the jam. Cook over medium heat for another 5 minutes until thickened, then remove from the heat. To assemble the toaster tarts, work with half the dough at a time. Roll the first set of chilled dough out into a rectangle. Cut into 6 squares, then brush half of the squares with the egg wash. Add a few spoonfuls of the strawberry filling, leaving a border around the edges. 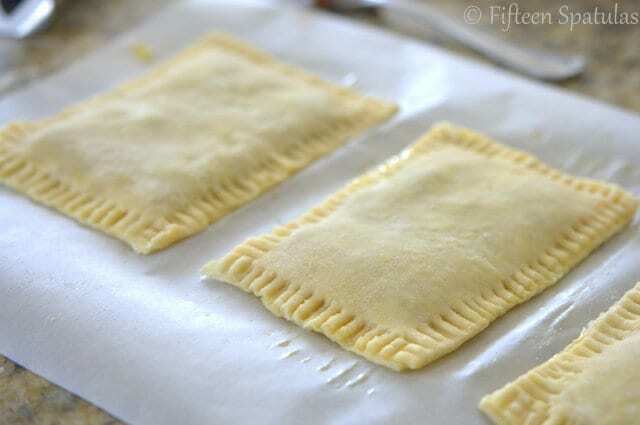 Cover each square with a remaining dough square, and crimp all the way around with a fork. Bake for 17-20 minutes until golden brown. Repeat with the remaining dough. 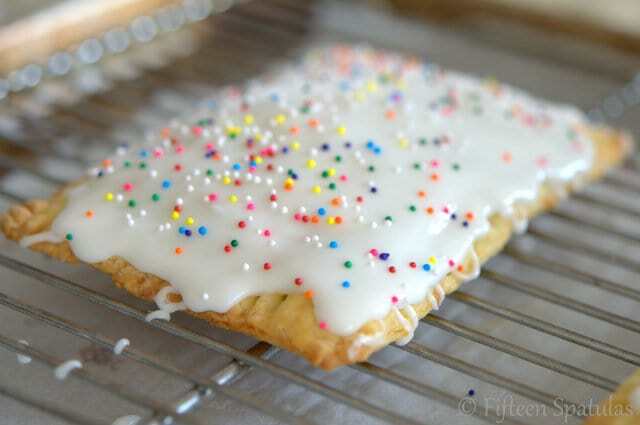 For the glaze, mix all glaze ingredients together (except the sprinkles) and drizzle it onto cooled toaster tarts. Add the sprinkles.